The young Brees was wearing a pint-size headset. It was more than just a fashion accessory — the star was protecting his son’s hearing from the deafening noise of a 70,000-person stadium. ABC News spoke to two experts — Bernard Rousseau, Ph.D., chairman of the department of communication science and disorders at the University of Pittsburgh Medical Center (UPMC), and Catherine Palmer, Ph.D, director of audiology and hearing aids at UPMC — about ways to protect your voice and hearing at the Super Bowl and other loud events. 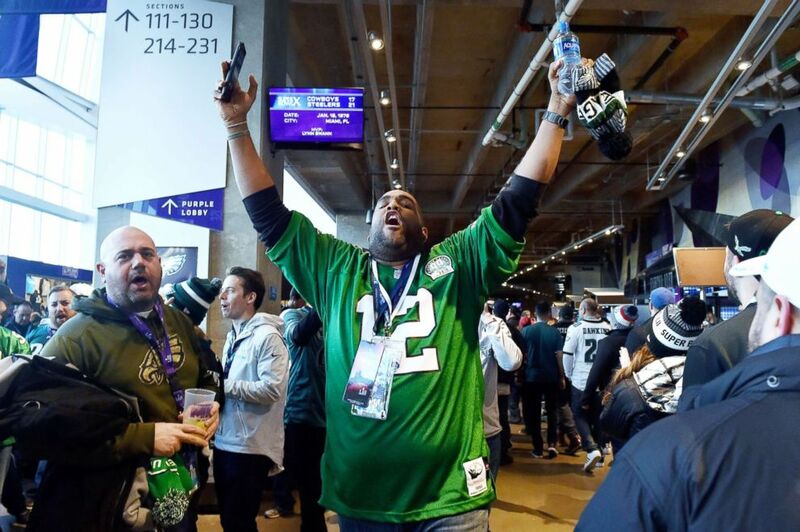 A Philadelphia Eagles fan reacts prior to Super Bowl LII against the New England Patriots at U.S. Bank Stadium in Minneapolis, Feb. 4, 2018. New Orleans Saints quarterback Drew Brees celebrates with his wife, Brittany, and son, Baylen. The New Orleans Saints beat the Indianapolis Colts 31-17, Feb. 7, 2010, in Super Bowl XLIV at Sun Life Stadium in Miami Gardens, Fla.
Rousseau, however, warned that even the best treatments may not fully repair one’s voice. “Julie Andrews famously had vocal fold nodules and those were operated on … and then she was later unable to sing the way she used to,” he said. “Anything you can do to allow tissue recovery after yelling, or minimize your yelling or shouting, will help … it’s similar to how a coach monitors time-outs throughout the game,” he said.